Jurgen Klopp has ruled himself out of contention to become the next manager of Manchester United. The 46-year-old Borussia Dortmund coach had been among the leading candidates to replace David Moyes, who was sacked by United on Tuesday. Managerial career: Klopp took over as Mainz coach on 28 February 2001 and, three years later, led them to the Bundesliga for the first time in their history. He joined Dortmund in 2008, replacing former Germany midfielder Thomas Doll. "I find it a little uncomfortable having to turn somebody down without them making an enquiry," Klopp said. "But it seems like I have got to do it anyway. There are about 1,000 reasons why I'm so happy to be working here." 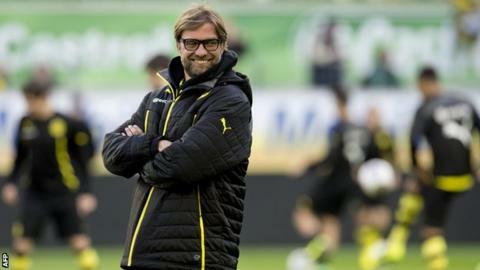 Klopp has won the Bundesliga title twice with Dortmund since he replaced Thomas Doll as manager in 2008. He also guided them to last season's Champions League final, in which they lost to Bayern Munich. The German extended his Dortmund contract until 2018 in October last year and said that, although United are a "really great club", he is not tempted to leave Westphalia for Old Trafford. He has also been linked with a move to Barcelona next season, but says "nobody has to have any concerns" about him breaking his deal with Dortmund. Netherlands coach Louis Van Gaal, Atletico Madrid's manager Diego Simeone and Paris St-Germain's former United defender Laurent Blanc have also been tipped as possible successors to Moyes. Veteran United midfielder Ryan Giggs, 40, will assume responsibility for first-team affairs at Old Trafford until a permanent manager is appointed.